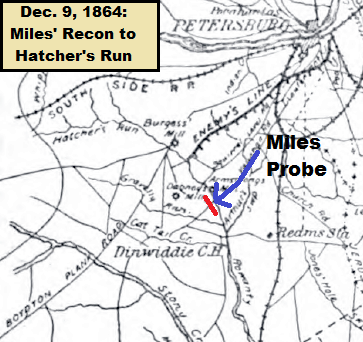 From December 9-10, 1864, 150 years ago today and tomorrow, the Second Corps division of General Miles and three regiments of cavalry made a reconnaissance down the Vaughan Road to Hatcher’s Run. George Meade and Ulysses S. Grant wanted Miles to probe the Confederate lines for weakness, and hopefully keep as many Confederate troops from attempting to interfere with Warren’s Stony Creek Raid as possible. On December 9, 1864, Warren’s reinforced Fifth Corps was in front of Hicksford, Virginia, near the Meherrin River. Warren had destroyed or was in the process of destroying about 17 miles of the Weldon Railroad from the Nottoway River to the Meherrin River. The force consisted of the First, Third, and Fourth Brigade of this division, three regiments of cavalry under Colonel Kerwin, Thirteenth Pennsylvania Cavalry, Battery B, First Rhode Island Artillery, Brevet Major Brown, and a section of horse artillery with the cavalry. The force left camp at daylight on the morning of the 9th, marching on the Vaughan road. A few vedettes were found at Cummings’ house, about a mile from Hatcher’s Run. These left as soon as the head of the column came in sight. At the crossing of the road over Hatcher’s Run the enemy were found intrenched on the opposite side, and opened with carbines as soon as our men appeared. The run had been dammed about one-eighth of a mile below the crossing, making the water about four feet deep and fifty feet wide. Holes had been dug in the bed of the stream, and trees slashed in it for a considerable distance above and below, making a most difficult obstruction. Unlike on December 8, when Kerwin’s Cavalry retreated with barely a half-dozen casualties, Miles was empowered to force a crossing of Hatcher’s Run on the 9th. But first he had to protect his flanks. He sent Kerwin with the 6th Ohio Cavalry and the 13th Pennsylvania Cavalry west to guard the crossing at Armstrong Mill and secure the Union right flank. The 3rd Pennsylvania Cavalry was sent to the left to secure a ford in that direction. His flanks secure, Miles now wanted to punch through the Confederates across the run. The 140th Pennsylvania was sent forward as skirmishers to probe the Confederates, but they were pinned down by heavy fire. Miles then asked Major George Hogg to detail several companies of his 2nd New York Heavy Artillery to volunteer for a sortie across Hatcher’s Run in a frontal attack. Ultimately the entire regiment, backed by the artillery fire of Battery B, 1st Rhode Island Light Artillery, plunged across the stream and successfully scattered the Confederate cavalry manning the redoubt there. The 61st New York also crossed Hatcher’s Run about 600 yards to the left, or southeast, of the Vaughan Road. Had Hogg’s attack faltered, the 61st New York probably would have forced a Confederate retreat anyway. Marched from camp, near Fort Fisher, at 6.30 a.m., 9th instant, down Vaughan road, preceded by cavalry. Met with no opposition until my skirmish line became engaged, near Hatcher’s Run Ford, with the enemy posted behind a work on opposite side of the run. The run being deep and much obstructed by fallen trees, the skirmish line was compelled to halt. Being ordered to cross the stream, I formed two companies Second New York Heavy Artillery near the ford, under command of Captain Armes, supported by two other companies Second New York Heavy Artillery, under command of Lieutenant Bliss, the whole supported by the remaining eight companies Second New York Heavy Artillery, under command of Major Hogg. At a signal from Captain Brown’s battery the assaulting party moved forward, under a sharp fire from the enemy, plunged into the stream, and a portion of them succeeded in gaining the opposite bank, the enemy flying at their approach. I would especially commend the gallantry of Major Hogg, who was the first to cross the run; also of Captain Armes and Lieutenant Bliss, who immediately followed Major Hogg. As fast as the troops could pass over they were formed by Captain Boyd, of my staff, behind the work holding the ford. I had directed Colonel Scott, with two companies Sixty-first New York Volunteers, to proceed ford, which was promptly done. Colonel Scott was then directed to send one company down the south bank of the run to a ford still farther below, which he did. After some delay a crossing was effected and the works occupied, the enemy leaving at once. The fords at Armstrong’s Mill, about a mile above, and on the road by the Cummings house, half a mile below, were then taken possession of and guarded. The cavalry was sent down the Vaughan road to Davis’ Shop, the infantry being posted to cover the fords and the roads leading to the right. The dam was cut to let the water off, and a practicable bridge built by night. At dark Brigadier-General Wheaton, with part of two divisions of the Sixth Corps, connected on the right, extending along the Squirrel Level road in the direction of the intrenchments. At dark the cavalry was withdrawn from Davis’ Shop and posted outside of the infantry on the Vaughan and Duncan roads and on the left flank. The major-general commanding the army thinks it not unlikely that your movement may bring on a general engagement, extending from Hatcher’s Run to our entrenchments. He thinks it more prudent that you confine your operations to holding your position at Hatcher’s Run with the infantry, and let the cavalry, with a small infantry support, push out and ascertain what they can of the enemy. I will order Wheaton to move at once to the vicinity of Tucker’s or Thompson’s, and co-operate with you and keep the road open. On the morning of the 10th parties of cavalry were sent in the direction of Stony Creek. These parties returned about 1 p.m. The information obtained by the various scouting parties was communicated to the major-general commanding in dispatches immediately upon their return. All of this probing by Miles drew a sharp Confederate reaction. However, Miles had already started withdrawing over Hatcher’s Run, having been ordered at 1 p. m. to return back to the Union trenches, his mission accomplished. The Confederates attacked Miles in the vicinity of the two fords over Hatcher’s Run, driving his cavalry in and to their infantry supports. Miles checked this attack and was followed by the Confederates as he withdrew up the Vaughan Road. Miles’ force was safely back in their camps by dark. The casualties were “20 wounded and 13 missing,” with all of those coming from Macy’s First Brigade. It was a small price to pay to tie up some Confederates who otherwise might have been sent in Warren’s direction. Before I end this post I wanted to apologize for the lack of detail on the Confederate side. I was not able to figure out the identity of the Confederates guarding Hatcher’s Run on December 9 or the Confederates who counterattacked on December 10. Noah Andre Trudeau shows the cavalry on December 9 as belonging to Young’s Brigade, but Young had taken most of this brigade’s dismounted men to Georgia to find horses, and J. Frederick Waring had the mounted men with Hampton opposing Warren’s Stony Creek Raid. Miles captured prisoners who claimed they were from Barringer’s North Carolina cavalry brigade, so these men may have been North Carolinians. I have unearthed no clues as to the identity of the Confederates on December 10. If you can help point me in the right direction, please use the Contact form at the top of this page. I admittedly ran out of time on this particular skirmish, doing the best I could to post a decent account of the expedition in one night.